You joked so much with us, I am not sure who was who!! But I had a lovely party with the champagne & menus. The food was first class and everyone said how good it was and we had made a wonderful choice. The waiters were great fun and I loved my day at the Toby. Please thank all your staff for making our 60th Birthday meal so perfect, it could not have gone any better. Your attention to detail was everything we wanted. We have had many compliments in the delicious food and excellent service. Hopefully many will make a return visit on their own. Dave & I would like to thank you all very much for the beautiful flowers you gave us for our anniversary. We had a lovely evening as usual. Great food, great people. 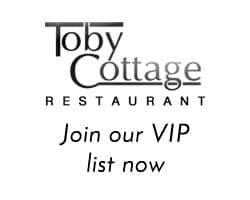 We have been visiting Toby Cottage for over forty years, but distance precludes our using it as frequently as we would wish. However, last Thursday, my wife and I had lunch there with our son and his wife. Though the staff have changed over the years, the restaurant still retains that lovely friendly atmosphere, as personified by yourself, Laurent and Estevan, and the high catering standards have always been maintained.